People were drawn to St. Anthony. He was widely known as a miracle-worker. Like those before him, and after him, whom God chooses to bring hope into the world through miracles and healings, St. Anthony always pointed away from himself, to the Lord. It was He Who healed, Who went out of His Way to bring about Miracle, so they would know He was with them, to the end of the world, and they need not be afraid. Anthony looked upon himself, as only a worthless pipeline for the Lord to flow through. St. Anthony performed miracles during his lifetime, or better, he obtained, through his prayer and penances, Miracles from the Lord. Even in his day, St. Anthony’s type of Christianity was not easy. Some of his fellow priests considered him unbending and stern; still, the faithful came in droves, for him to hear their confessions. The hours he spent in the confessional, thoroughly poured out and exhausted to the point of dropping, were enough to have taken his life at 36 years old. Imagine carrying all those sins upon himself, as he took the place of Jesus, in the confessional. Maybe, the most moving quality, penitents saw in Anthony, was the compassion behind his unrelinquishing, uncompromising living out of the Gospel. With this, he could touch even the most stubborn. Maybe, as we pray for our lost loved-ones, we should try praying for St. Anthony’s intercession. There has always been an Anthony in my life. Even before I knew who Saint Anthony was, and what part he would play in my life, there was an Anthony in my life. You see, my middle brother’s name is Anthony, and although six years older than I, his job was to take care of baby sister. He grumbled a lot at having to drag the pest along with him and his friends, but he did. When I could not keep up with his long legs, he carried me on his shoulders. We fought, as brothers and sisters do, but do not let anyone else try to hurt me; I could always rely on my older brother to defend me. As I grew into a teen-ager he became my advisor to the lovelorn. I didn’t always welcome his counsel, but darn him, he was always right! We each married and moved miles apart. But the Anthony of my intimate family was to be replaced, as an instrument, by another Anthony. Our precious son died, and we died along with him. We turned off God and His Church, and although we didn’t know it, Bob and I were on the way to turning each other off as well, when St. Anthony came into our life. The St. Anthony who appeared in our life, after almost four years of us not asking anything of St. Anthony, or Jesus or any other member of our Heavenly family, was a curly-haired Sicilian-American. This Anthony persisted and persisted until he led us to Marriage Encounter and new life in Jesus and the Church. Even the Seminary at the old Mission in Santa Barbara, California, where we went for our Marriage Encounter week-end, was called, right again, St. Anthony’s. Of course, I was completely unaware, at the time that St. Anthony was interceding in my life. But that doesn’t stop Jesus, His Mother or any of His Saints from consistently helping us. The pieces finally started to come together, when the fool (that’s me) began to grow up. As we learned more about this wonderful, exciting Faith of ours, I began to realize St. Anthony was not merely a statue my grandmother had on her altar, in our bedroom. He was not solely someone you prayed to find lost items or a husband. I wanted to know more about this special man, this St. Anthony, and so, the search began. In the United States, he has been given the obscure title of “Finder of Lost Articles.” Whenever we lose something, we ask St. Anthony to find it for us and, more times than not, he answers our prayers. St. Anthony was born on the Feast of The Assumption of Mary into Heaven, August the 15th, 1195. All his life, he was strongly devoted to our Lady and Her Assumption into Heaven. As he staunchly defended the Son, he championed the Son’s Mother, as well. Show me a Saint and I’ll show you Mary in his life. Although, there is little information about St. Anthony’s youth, there are legends that have followed him, filling in the blank pages, for almost 800 years. One of these legends takes place when Fernando was quite young. His father, upon returning and not being able to find his son, became frantic. Combing every inch of the hillside, as a last resort, he thought to look in the church. There was Fernando deep in prayer! Before his father could scold him, Fernando took his father’s hand and led him into the house. As they opened the door, the singing prisoners flew out to freedom and the crop. As a priest, the older Fernando, later said, “The waves of the sea, when they hit a rock, break, and the tempest of temptation which hurts you will break if it finds you united to Christ.” Was this in memory of something that happened when he was still a boy? One day after Mass, Fernando, having stayed behind to pray, felt something stirring inside the church. He looked up toward the choir-loft; he saw a face so hideous, it made him tremble uncontrollably. It was the face of Satan; he was going to stop the boy from praying, if he had to scare him to death. Fernando could no longer pray; he was frozen, paralyzed with fear. With all the strength he could muster, he traced a cross on the floor. As quickly as he had appeared, the vision disappeared. Tears of joy welled up in the little boy’s eyes; the Lord, his Shepherd had frightened Satan away. The only sign of the encounter was the cross which remained on the floor. Although their land was reclaimed from the Saracens, real peace had not returned to Portugal Fernando’s father, advised his son to pursue the call to arms. With other young men of his station, Fernando developed an agile and strong body, a courageous spirit, and a boldness to do right, no matter the cost. Even though he and his father thought this was for the defense of country, we will see how God will use this training for defense of His Church. The world was also tempting him with good: attachments and concerns tugging at him, pulling him apart. His country and family needed him (chivalry). Why couldn’t he marry and have a family (pure love)? There was nothing wrong with all the world was offering; then why did he see it as flawed and lifeless? 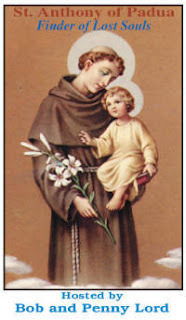 We often see a statue or painting of St. Anthony holding a lily, a sign of purity. This purity, like with St. Francis, was an ongoing war that could only be won with strict discipline and hard struggle, over many years. As he found himself being called more and more to the priesthood, he had to fight, not only his parents’ dreams for him to take over the family estates and give them grandchildren, but the lure of ambition, his desire to amount to something. Only the whisper in his heart, that gentle tugging at his spirit, kept him on the road to the Lord and the priesthood. The above article is an excerpt from the Chapter on St. Anthony of Padua in our book, “Saints and Other Powerful Men in the Church. For more information click here. You are currently browsing the archives for the Saint Anthony of Padua category.